Every spring thousands of people gather in Washington D.C. and other cities for the Sakura Matsuri Japanese dance festival. The "Cherry Blossom Festivals" showcase the food, art, and especially the dances of Nipponese culture across the United States. The tradition of dance at street festivals stems from Japan. Some festivals include traditional martial-arts style movement performed by schools and cultural groups. 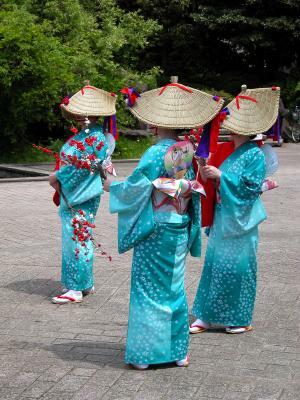 The costumes and choreography (as seen in YouTube videos such as this one in Nagaoka) are rooted in various Japanese folk dances. Dances such as the large-group Yosakoi Dance from Kochi City are favorite parts of any festival with dancers of all ages and abilities participating, dressed in colorful costumes. It's no surprise that Japanese-Americans would celebrate such a vibrant part of their heritage. The largest Sakura Matsuri festival is celebrated in Washington D.C. as part of the National Cherry Blossom Festival, which takes place when the trees are blooming in late March and early April. There are dozens of performing and martial arts groups that fill the stages at these festivals, such as The Tamagawa University Dance and Taiko Group (a folk dance and music group from Japan), and 10tecomai which melds traditional and contemporary movement. Modern performances can also be found at the Sakura Matsuri, such as Reni Mimura's "Cosplay" performances. The street festival in Washington D.C. is a family-friendly event where visitors can enjoy great food and art while watching dance performances on over thirty different stages. Dances include traditional martial arts such as the samurai sword and taiko drumming, providing a wide spectrum of the movement arts from Japan. Another large Japanese Street Festival takes place on the opposite coast of the United States. In 1973 three young community activists in San Francisco created a street fair for "J-Town", the Japanese cultural center of the city. It was organized to protest the commercialization of J-Town, but it has become more of a celebration of all types of Japanese culture from the traditional to the modern. The very first fair included performances by the San Francisco Taiko Dojo which combines dance with percussion. This troupe has also performed at the San Francisco Cherry Blossom Festival. There are many other cherry blossom festivals throughout the United States, such as in Southern California and Hawaii, and many include performances of various forms of odori (Japanese dance). The Subaru Cherry Blossom Festival of Greater Philadelphia includes groups such as the Kashu-juku Noh Theater, which preserves a movement form dating back to the 14th century. The troupe performs both dramatic mai-bayashi (meaning dance and music) solo pieces, and also comedic kyogen forms such as the famous boshibari. This classic tale is similar to the three stooges in America, portraying two hapless servants punished by their master for drinking too much. After the 2011 earthquake in Japan, many of the festivals started including fundraising as part of the celebration. It also inspired hip-hop dancers to organize the first Japan Relief Street Dance and Art Festival. It was designed not only to raise relief money for the earthquake, but also to support "bboys and bgirls from the Sendai area," where the earthquake damage was the worst. This sharing of the culture of breakdance across the oceans featured dancers from Japan such as Macky and Hi-B dancing alongside American street dancers like Sa-Ewl and Jay'D. The Japanese street festivals throughout the U.S. help preserve the culture and blend it with American dance forms. Sharing joy in movement has always been one of the best ways for humans to be together, and dancing Japanese in the streets remains one of the best rites of spring to be found.